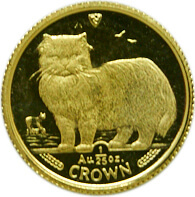 Manufactured by Pobjoy Mint, with a Manx cat on one side and Queen Elizabeth 11 on the other. The Gold Crown Coin’s origins date back to the 16th century with the English Crown. This changed in 1707 with the union between England ad Scotland, when the British Crown was first introduced. All Crowns in this era were made of gold (originally with a value of five shillings), but this changed in 1662 when Charles II undertook a major rehaul of the coinage. Gold Crowns were reintroduced in 1990, with cupronickel and silver editions. 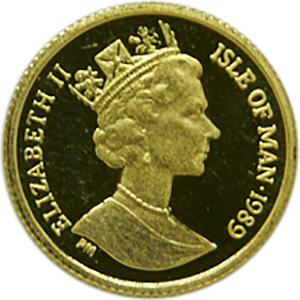 With the introduction of Gold Britannia’s in 1987, the Crown’s popularity with investors has dropped, but it still remains a highly popular coin with collectors, with special editions regularly being released yearly. The modern edition of the Crown is 24 carats, among the very purest of all gold coins in the world, while the older versions are 22 carats. The value of both coins are affected by its historic and collectability, but, depending on the coin’s condition, Crowns sell above spot price (the coin’s gold content value alone). A Crown’s face value was changed from five shillings (25p after decimalisation) to £5 in 1990. Most Commonwealth countries still produce the coin to this day, although special editions mean it is hard to value these individually. One of the most popular special edition Crowns are those produced by the Pobjoy Mint, Europe’s largest private mint. These include the Isle of Man cat series, whose collectability is very high. The Pobjoy Mint is among the most renowned mints of the world, alongside government institutions, such as the Royal Mint. Unfortunately, there are many forgeries on the market, so it pays to ensure that any coin is bought from a reputable source. Goldinvestments.co.uk is one of the UK’s oldest vendors and, unlike many trading online, we have a London based office from which we are happy to share our expertise.